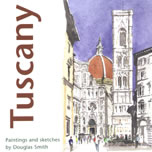 Douglas Smith, an artist architect traveling with sketchbook, explores the dazzling countryside, fascinating architecture and art of Tuscany. For just �25.00 get 2 x 120 page, full colour, hardback books (Website ONLY offer, inc. P&P). All profits from this special offer go to Hope Against Cancer, for whom Douglas wishes to help raise �20,000.